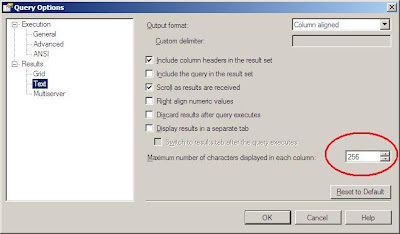 The output of query results in SQL Management Studio (Microsoft SQL Server 2005, 2008) is redirected default to Grid(s). Optionally you may want to redirect them to text (for example, to re-use output as composed statements etc.). You will be wondered, why the same results are displayed complete while "Results To Grid" set and trimmed to 256 chars once you switch to "Results To Text". Adjust the setting "Maximum number of characters displayed in each column" and enjoy!